The HFCA established the Golden Globe Awards, held for the first time on February 11, 1944, as an informal luncheon at 20th Century Fox Studios. That year the winners received a scroll, as they did in 1945 at ceremonies held at the Beverly Hills Hotel on April 16. In 1946 a shiny globe on a cylindrical pedestal, to represent the world, was first awarded on March 30, at the Hollywood Knickerbockers Club. 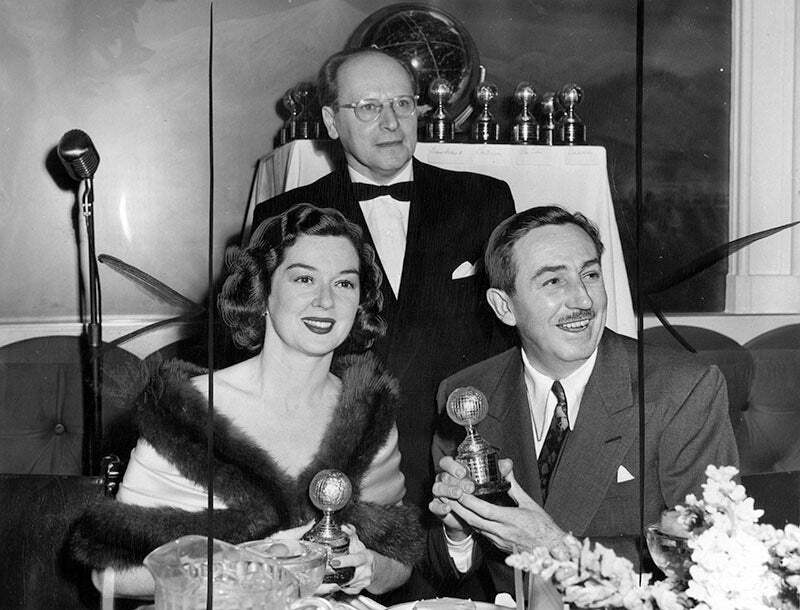 In 1947, 1948, 1949 the Golden Globe Awards were held at the Hollywood Roosevelt Hotel, in 1950 at the Ambassador Hotel. In 1951 Ciro, a nightclub on the Sunset Strip, became the location for the Golden Globes and the monthly luncheon meetings that had been a HFCA tradition from the beginning. In 1952 the HFCA created a special award, “for extraordinary achievement in the Motion Picture Industry,” named after its first recipient, Cecil B. deMille. The trophy (a globe surmounted by a man holding up a laurel wreath) was presented to deMille at the 9th annual Golden Globe dinner, held on February 21 at Ciro’s. In the summer of 1950 a group of “working newspapermen and women” withdrew from the HFCA, as their 1953 Membership Directory states, because they felt that a majority of the membership consisted of non-professional journalists, and they formed the Foreign Press Association of Hollywood (FPAH). They held weekend galas called World Film Favorite Festival in 1951, 1952 and 1953, handed out Henrietta awards. In 1954 the two organizations agreed to sponsor a joint awards banquet, as International Press of Hollywood, on January 22, at the Club Del Mar in Santa Monica. They repeated the joint event in 1955, on February 14, at the Cocoanut Grove in the Ambassador Hotel. On October 19, 1955 HFPA and FPAH officially merged under the current name of Hollywood Foreign Press Association (HFPA).